After Valkyrie’s episode with Darquesse, she understandably felt even just in part responsible for the evil her alter ego reaped. Therefore, she like her ex-partner, feels the guilt of something they had little doing in and little control over and feels the need to make up for it somehow, if only a little, but enough to prove at least to themselves that they’re better than that. Even still, when every time you close your eyes to so much as blink the horrifying images of what someone who was not you, but was still a part of you, has done, flash before you never giving you a moment alone to drown in your own guilt, even the strongest of us would soon fall into despair. So I suppose it’s not a surprise when Valkyrie feels the need to deprive herself of comforts, like her family and friends, who’d tell her she’d no control over the events that had passed, until eventually even she herself would end up believing them and then she would finally get a night of actual sleep. Unaccompanied by her gruesome nightmares and uninterrupted by her frequent waking only to find herself drenched in sweat, and that would be a good night one where Valkyrie would actually get something that even distantly resembled sleep, but she doesn’t deserve that, she deserves to suffer, after what happened. This is the dark thought chain that leads Valkyrie to live in America, in solitude for a number of years, miles away from anyone who’s ever shown her love, apart from her new companion, Xena, her dog. The story picks up a few years where the last book (The Dying of Light) left us off, but the simple world of Magic, Valkyrie once new is gone, new advances in Magic has left that once proud but simple time behind. Now with the new massive city of Roarhaven for sorcerers to live in, the world of Magic has advanced many times over, primarily due to the fact that Roarhaven now has a Magic school of it’s own, solely for sorcerers. Unfortunately the school isn’t big enough to support the entire Magic world on it’s own, so only the rich, powerful or famous can attend. So if you thought anyone who goes there, probably wouldn’t be your top choice for someone who just blends in, you’d be wrong. Omen Darkly, no not the chosen one, but his brother, is Skulduggery’s prime candidate for such task. But is Skulduggery wrong to involve someone so young in something so ‘potentially’ dangerous? Well Valkyrie certainly thinks so, but why would her opinion matter anyway, she’s only back on a temporary basis, unbeknown to Skulduggery. All Omen, desperate to put some meaning in his life, can say is,’potentially dangerous’, so it may not be dangerous at all, but Valkyrie has different ideas, even if they mean she herself is hypocritical. 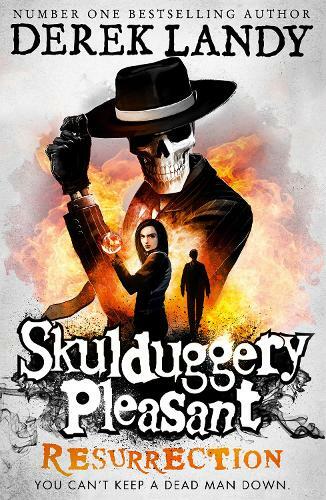 With Valkyrie back in Ireland, Skulduggery only but assumes Valkyrie would be happy to help out on such a case, especially when it’s only a regular old boring case, that totally could not quite possibly escalate out of hand into, yet another instance of their saving the world!